The express crafts were designed for, as their name would imply, quick deliveries. 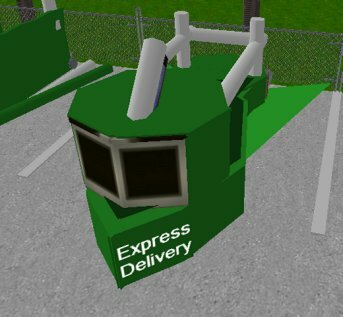 Designed to take advantage of Alphaworld's autobahn highways that span the vast, barren lands, you'll see these crafts flying by delivering important, urgent goods. They've been known to be seen with police escorts from time to time. The first model had room for 2 standard issue crates, and were equip with an Ener-Glide V3 drive. Without load they can reach 200mph, but with a 4 ton load, can reach 140 mph. 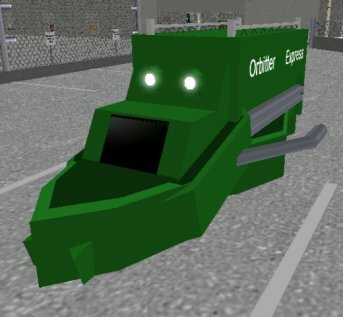 The Orbiter Express had good intentions, but unfortunately it had many flaws which kept it from being adopted by the public. The most serious problem was the open bed, which spelled certain death for cargo on high-speed runs. CommieCorp also attempted thrust vector stabilizer systems, which didn't work out too well at high speeds and heavy loads. The gyro stabilizer fins helped, but made the craft heavier and clumsy. The manufacture went back to the drawing boards and overhauled the Orbitter Express. The 2005 model vastly improved upon the 2002. Most noticeable is the covered cargo hold, which also boasts a boosted hauling capacity while traveling faster than the 2002 model. Powering the craft is the new Python SDIS (Synchronized Dynamic Inject System) engine, using state-of-the art technology. The new deluxe balancing system uses a complex array of electromagnetics to accelerate fluid balancing. To top it off, it also includes a roomier cabin and sharper appearance.